The house is popularly known as the house of Giulietta, but probably it is historically false. The coat of arms sculpted on the walls is the one of Dal Cappello family, not Capuleti's. 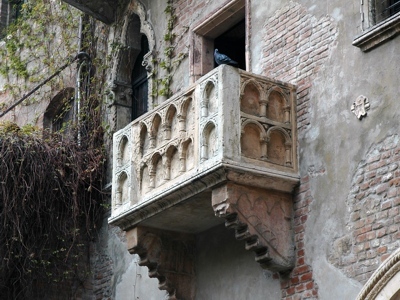 Moreover the balcony, depicted in the renowned Shakespeare's tragedy, is a modern addiction built in response to the requests of the many fans of the story of Romeo and Jueliet. It is one of the finest and most famous Roman Amphitheater in Europe and, since its construction, has always been utilized for displaying games, plays and concerts. 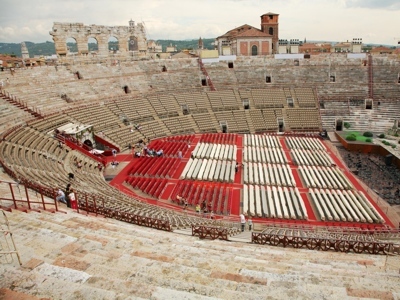 It dates back to the first century and is made in the particular pink Verona marble. A popular legend says it was built by a prisoner condemned to erect the arena brick by brick. 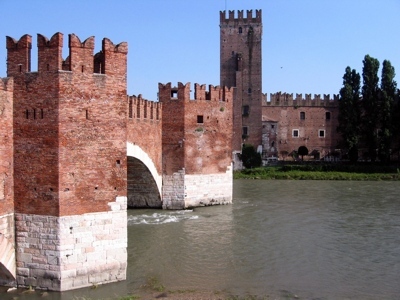 The Castle of St. Martins in Aquaro, colloquially known as Castelvecchio, old castle, and the Dalla Scala Bridge are two finest example of military architecture in northern Italy. The bridge, originally built in the 14th century by Giovanni da Ferrara and Jacopo da Gozo, was unfortunately destroyed due to the Second World War bombing, and lately rebuilt in the 50s. The two buildings share the same red brickwork walls, topped with crenellated walkways. The castle currently hosts the civic museum where several masterpieces of Veronese and Venetian school are kept.